Nowadays, we look up to fashion bloggers as prime references to the latest trends. So when the time comes for this generation’s most stylish individuals to step into a new chapter of their life, we can’t help but anticipate how they’ll put a twist to traditional ceremonies. 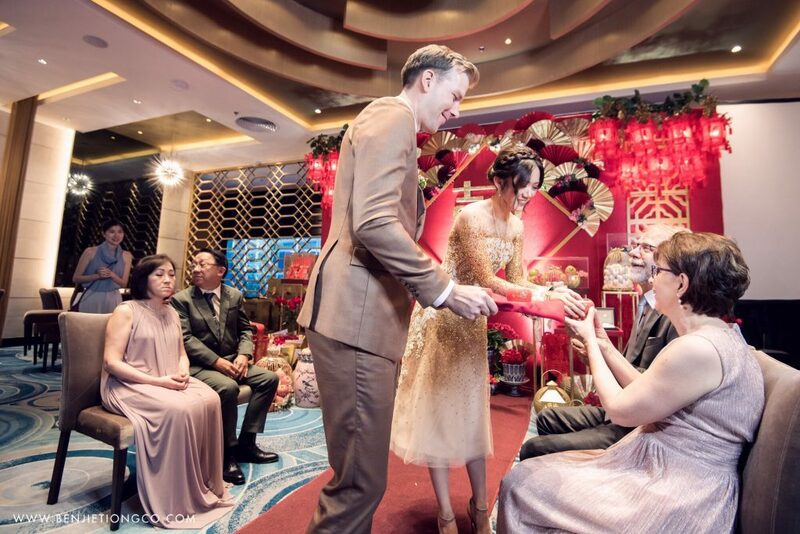 Paying homage to tradition was exactly what designer and fashion blogger Camille Co and fiancé Joni Koro achieved when they decided to hold a traditional Chinese engagement called Ting Hun. 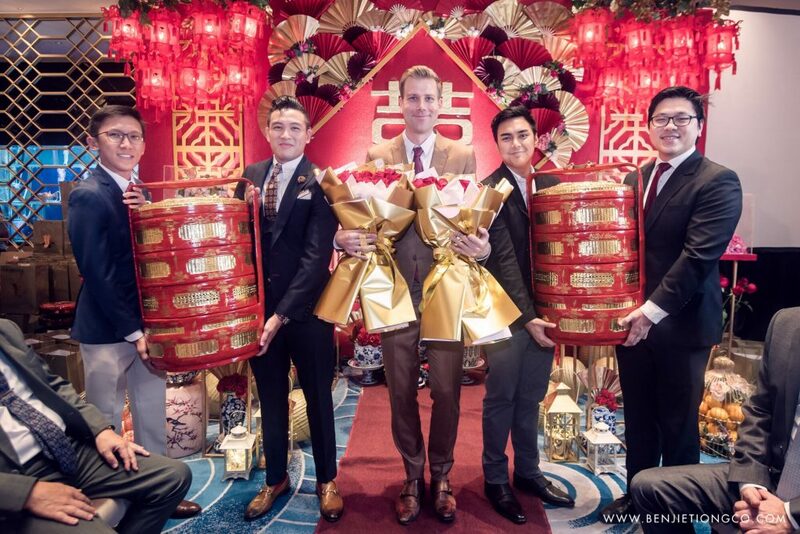 Similar to the Filipino tradition of pamamanhikan, Ting Hun is the gathering of the couple’s family to formally announce the couple’s betrothal. 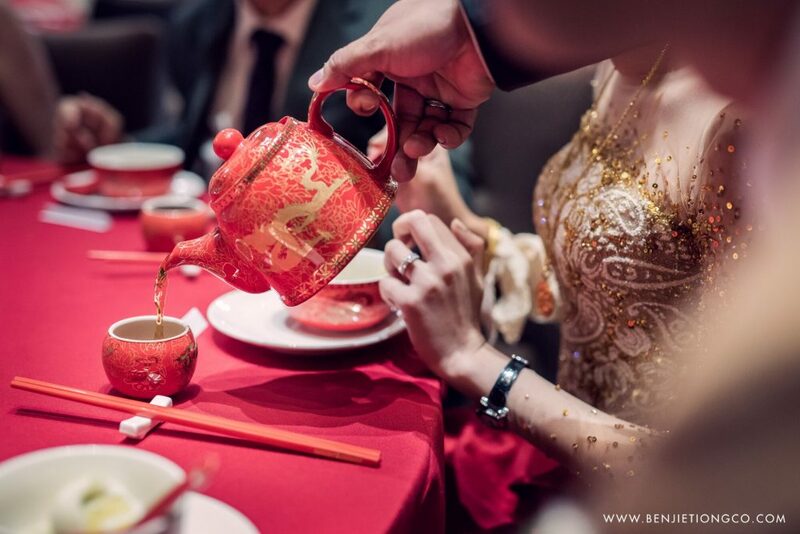 It involves several ceremonial gestures such as the bride walking backward before coming face to face with her future hubby, exchanging gifts, and serving tea. 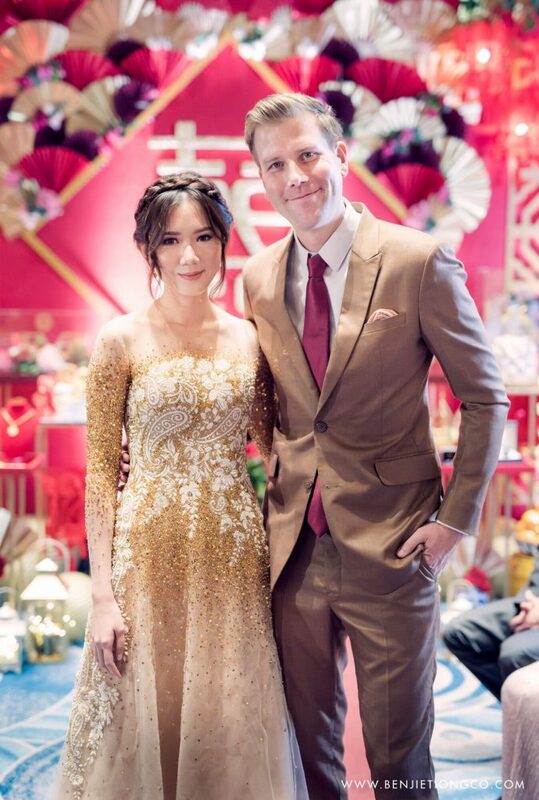 According to Camille, they have planned to do a destination wedding in April and staging a Ting Hun was for her parents who wanted a more traditional gathering in Manila. 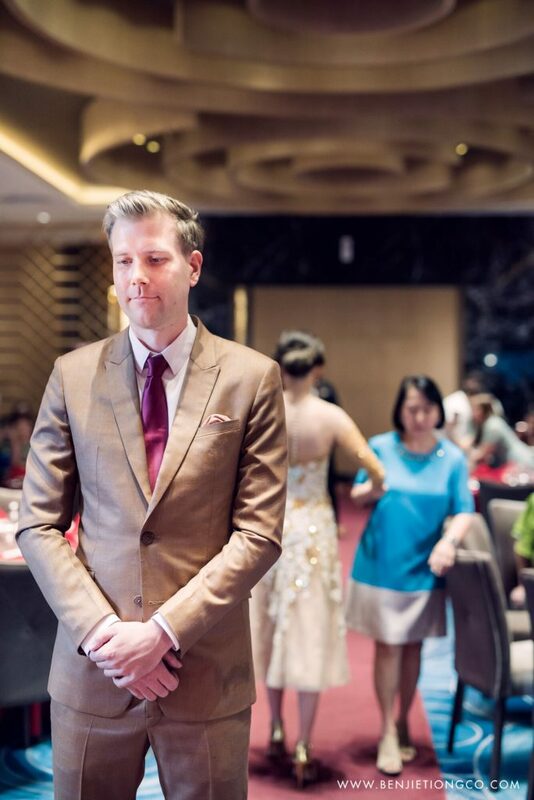 Knowing very little about the technicalities of planning and executing such an event steeped in age-old rituals, they turned to expert Ting Hun event coordinator, Tris with Love. 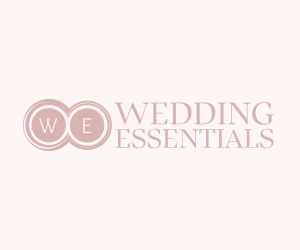 All the planning was done at the last minute since everyone was already so busy prepping for their upcoming nuptials, but their event planner made sure everything was put together according to Camille’s specifications. “I didn’t have a theme in mind, I just wanted traditional colors but in a more modern design.” she shares. The event was held on February 10, 2018, at the East Ocean Place, Aseana Business Park. 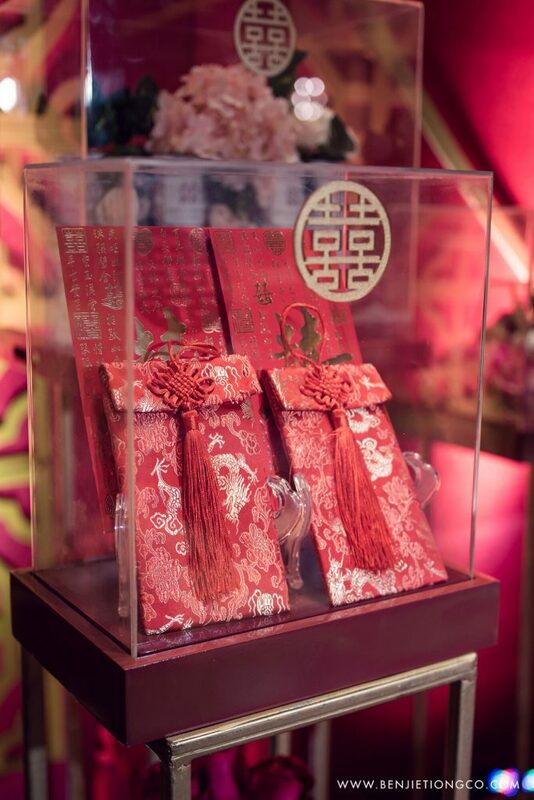 According to Majic Touch Styling Event, who was in charge of the wall décor and backdrop, they created an elegant yet traditional backdrop that reflected old Shanghai glamour with modern accent pieces. 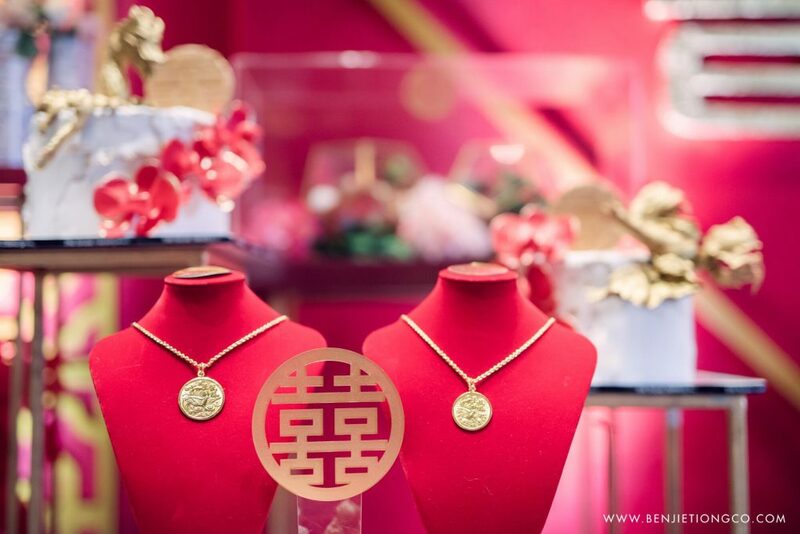 Auspicious colors of red and gold were prominently used, as they are traditionally associated with Chinese culture. 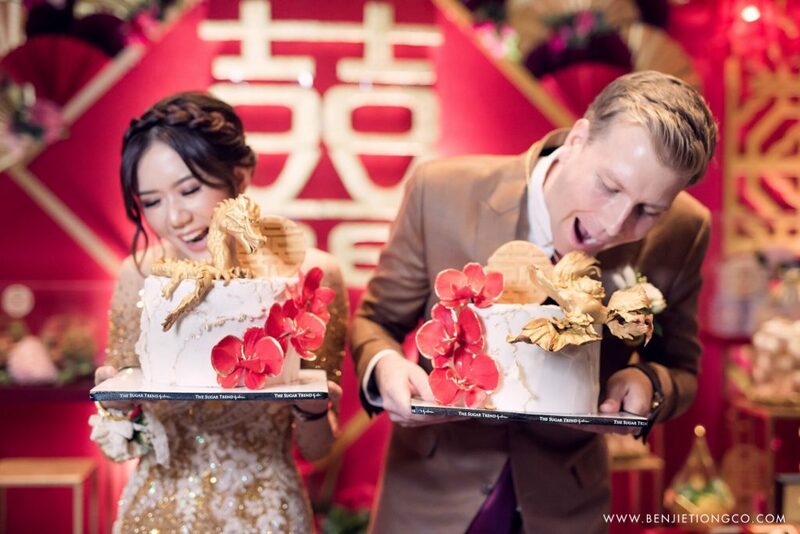 One of the prettiest elements of the ceremony were their twin cakes from The Sugar Trend. Camille wanted a modern cake design incorporating lucky symbols such as dragons, phoenixes and double happiness signs. She wanted flowers added to the cakes as well. 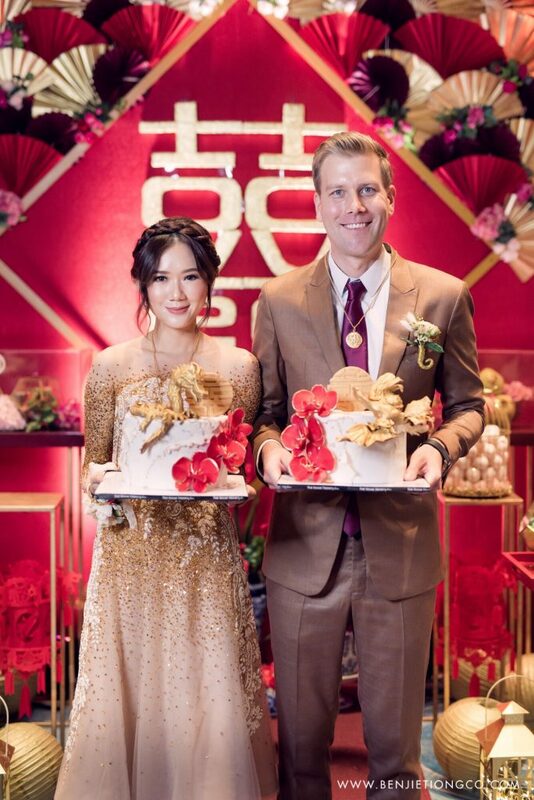 The result was a masterfully combined red velvet cake with all the elements she mentioned with red orchids as accents as it symbolized love. 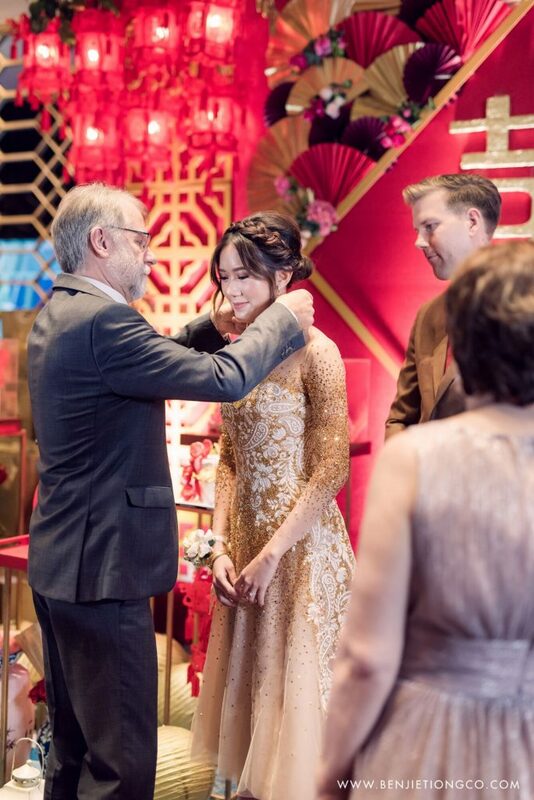 Camille was the picture of a perfect Chinese bride-to-be. Even if she didn’t choose to wear a qipao, she still wanted to wear something with touches of Chinese design. 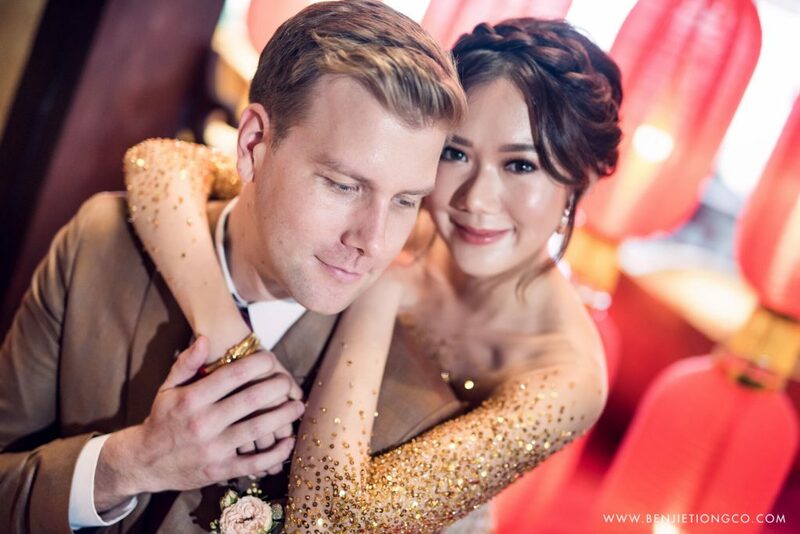 “Since my color motif for the décor was already red, I went for gold for my dress. I’m already clumsy as it is walking forward, so walking backwards in a gown is a clear no. 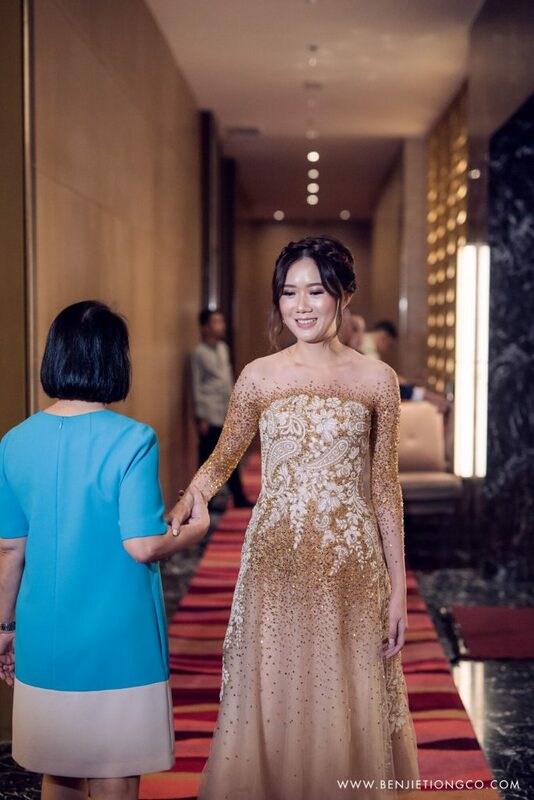 I didn’t want our tinghun to look too grand or formal as well,” she explains. Camille opted to wear a dress of her own design from her label CoExist, which was a bittersweet gesture since the dress was to be the last piece made by the label. The stunning tea length dress had white lace appliques and embellished with hundreds of golden beads. 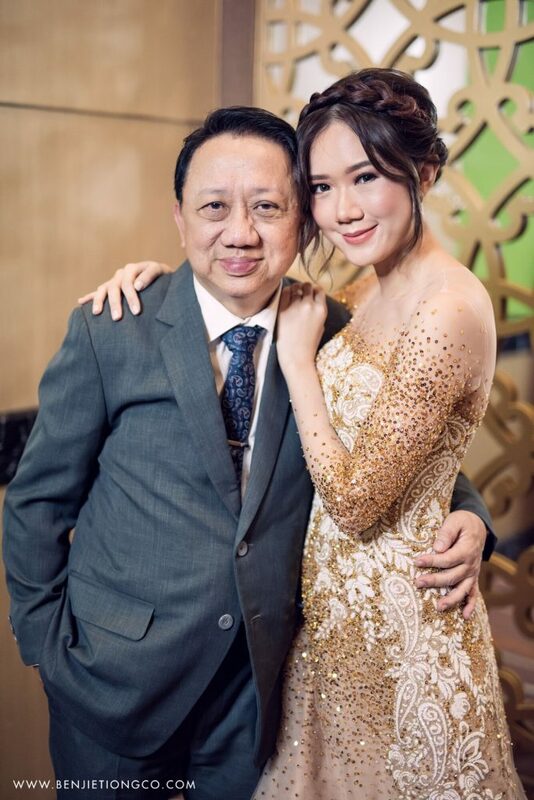 To complete Camille’s look, Marvin Santos created a soft braided updo for the bride-to-be while Mariah Santos enhanced Camille’s beautiful oriental features with soft peach and brown tones for her makeup. 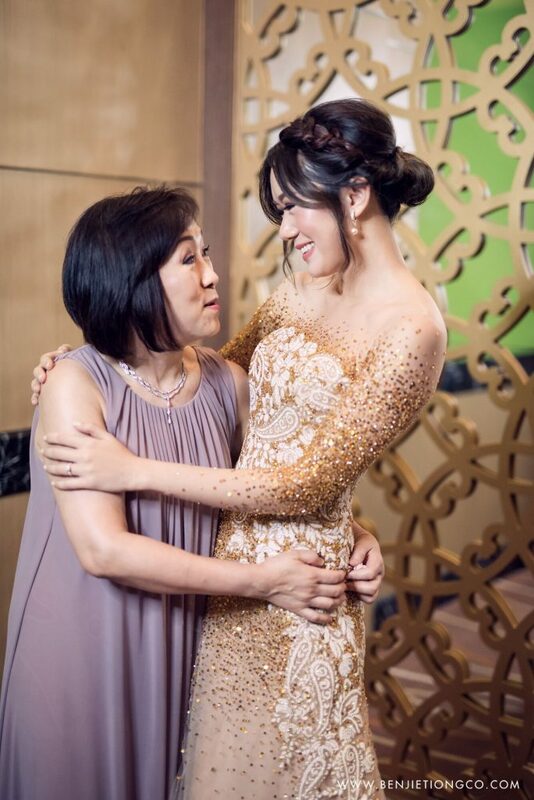 If the whole event was memorable for Camille and her family, then it was definitely a cultural experience for Joni. The Finnish born Joni had very little knowledge of what a tinghun was. 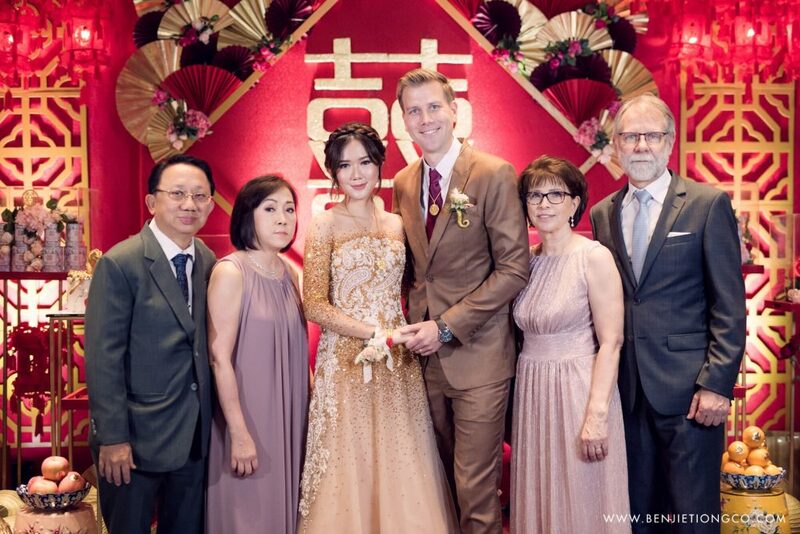 The ceremony took place on his birthday and with his parents being present, it made everything more meaningful. “I enjoyed it. At least I have a better understanding of the tradition now,” he says. 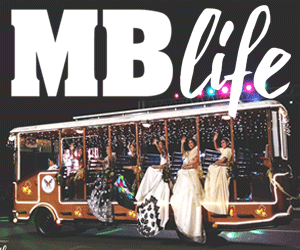 The biggest priority of the people behind the ceremony was to create something fun and vibrant for the young couple. Traditional yet modern were the two key words emphasized by the couple in conceptualizing the look and feel of the event. These words weren’t only reflected in the décor, the food or the couple’s wardrobe choices but it also highlighted the joining of two families from two very different cultures.